Please see our tea list as we serve 100 different types of loose leaf tea! All items are baked by hand using natural ingredients and cooked in our propane oven. The baker starts work at 6:30 am to bake our daily selection of sweets, soup and bread. Fresh supplies for baking and sandwiches are trucked in from Calgary and carried in by staff almost every day. Our dry goods (flour, sugar, oats), propane and bottled water is flown in by helicopter once a year. Please remember to pack out any garbage that you may bring in as we carry down all of our garbage and recycling. Items may contain or come in contact with nuts, seeds, gluten and dairy. 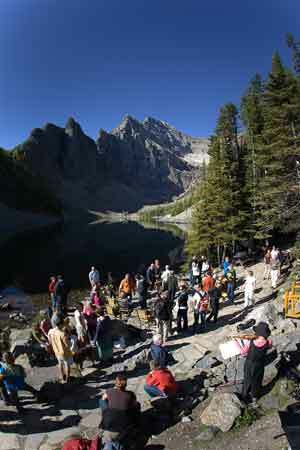 Thank you for your visit and we hope you enjoy Lake Agnes and the place we call home! Baked Goods and lunch items change daily, check the chalk board inside for today’s specials. Please be patient as all items are prepared individually. Classic & Specialty Tea: Check our tea list for over 100 types of loose leaf tea for you to enjoy! Lake Agnes T-shirts and Loose Leaf Tea Gift Bags available at the kitchen!